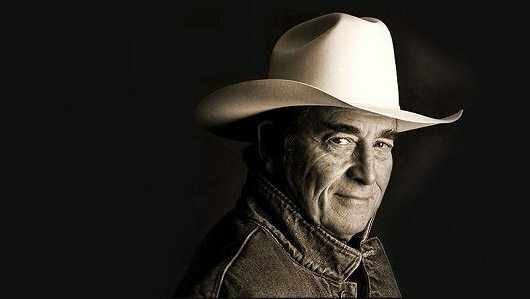 The 2012 Calgary Stampede Parade Marshal, is the legendary country music singing cowboy, Ian Tyson. His life’s work is familiar to anyone in Canada who loves country music. In his early days he learned to play guitar in hospital, recovering from a bad fall in a rodeo. From there he upped stakes from Vancouver Island and hitchhiked to Toronto, where he met a young singer from smalltown Ontario named Sylvia Fricker. As Ian & Sylvia, they were the Canadian stars of the early ’60s folk boom that gave the world Bob Dylan, Phil Ochs, Joan Baez, the Clancy Brothers and the Kingston Trio. The response to his 2008 album, Yellowhead to Yellowstone, was enthusiastic. Once people got used to his different voice, the new songs resonated in the same way that so many of his classics had. Now, with the 2012 release of Raven Singer, there are signs that Tyson’s voice is recovering. Tyson made the record over a three-year period, as he wrote the new songs. His travels have provided the background for two of the 10 remarkable songs — “Under African Skies” and “Back to Baja.” The first is partly travelogue and partly a story of “running from the memories” of a broken relationship. The latter has a distinctly southern Californian feel and is a song that Jimmy Buffett would feel at home singing. For more background information on Ian Tyson visit iantyson.com. Tyson will also celebrate the Centennial Calgary stampede with an intimate, one-of-a-kind event at the Martha Cohen Theatre. Tyson, along with JUNO award winner, Corb Lund will present 100 years of Calgary Cowboys, an evening of stories, songs and memories.